Just the other night I was lamenting about the quality of advertising on TV these days. Gone are the days of pushing Armstrong Excelon asbestos floor tile and Chesterfield cigarettes. Gone are the days of the Rainer Beer bullfrogs or the Colt Malt liquor commercial with the waiter in formal attire, riding a surfboard, delivering the goods. The Marlborough man's taking a dirt nap and Joe the Camel has ridden off into the desert sunset. Nope nowadays, we're bombarded with pharmaceutical commercials, with more warnings about the side effects than the actual product itself. Got this problem, take this drug. That problem, take a different drug. Seems like nearly every commercial is pushing something different in pill form these days. As the years go by, it gets harder and harder to either justify, or afford, adding to my collection. Such is life. Once in a while though, something gets dropped in my lap that really stokes my fire. 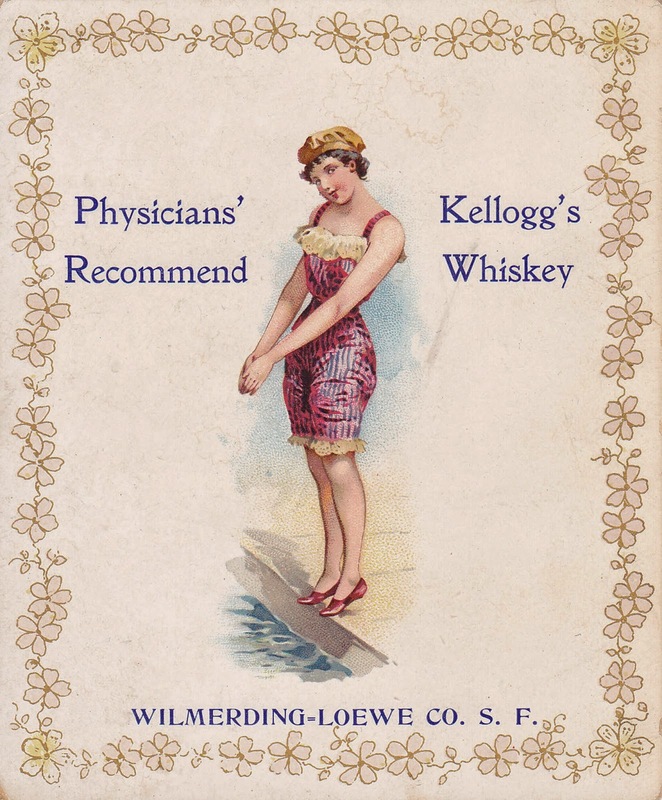 Now I don't know what a cute young Victorian lass dressed in a (for the time) somewhat risqué swimming outfit and red shoes, perched on the edge of a swimming pool has to do with Physicians recommending Kellogg's Whiskey, but it sure beats the heck out of today's TV ads! Thanks again Marty, you made my weekend!